Ministry of Propaganda - 03/Oct/2006: "Gratuitous Kitten Picture Blogging"
Today I thought I'll do some gratuitous kitten picture blogging. 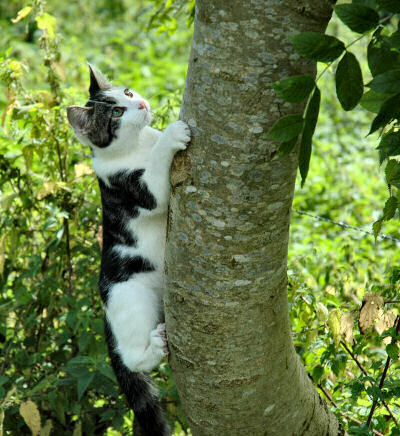 Have a picture of a kitten climbing up a tree. Why? Because. I'm quite busy with a few other things, fairly unimportant things like job hunting, uncluttering my flat and life, trying to sell some of the clutter on eBay, making some progress on the Scotland Summer 2006 travelogue, testing beer for my Islay blog and getting more sleep. Those kind of things. So I'm resorting to posting pictures of innocent kittens for your entertainment. Shocking, isn't it? Oh, and according to a German blogger the time for 'generic blogs' might be over, the future might be special interest blogs. Hm, should I spend even more time on IslayBlog.com, a blog about the Isle of Islay, Scotland? After all you can't get much more special interest than that. Or try to find some more focus for this blog? Whatever, I'm off to bed for an early night. Why? Because.